Arm rest locks for Ocean, Ocean SP, or Ocean XL manufactured prior to 07/2011. 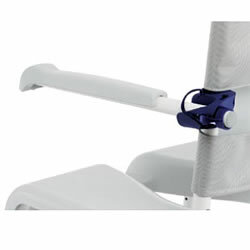 One pair of arm rest locks for Ocean, Ocean SP or Ocean XL Shower Commode Chairs. Will only fit models prior to 07/2011.